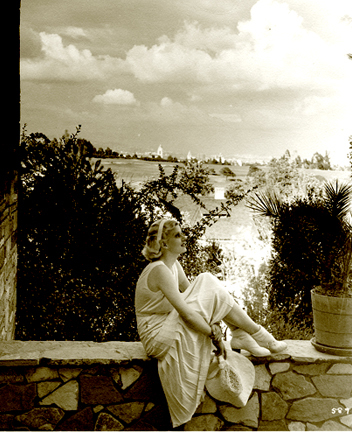 Author’s note: This interview was originally published in 2011 in celebration of Jean Harlow’s 100th birthday, and the release of the book Harlow in Hollywood: The Blonde Bombshell in the Glamour Capital. We re-print it here in celebration of the book’s 5 year anniversary, as well as the one year anniversary of The Retro Set’s screening of the Jean Harlow classic, Libeled Lady, at Hollywood’s Silent Movie Theatre. While it was her platinum hair, sensuous body and brazen sexuality that made the Jean Harlow image an icon– it was her sincerity, warmth and gentleness of spirit that made her truly beautiful. And it is that beauty– the woman beneath the platinum locks– that the new book Harlow in Hollywood: The Blonde Bombshell in the Glamour Capital, 1928 – 1937 valiantly endeavors to present in a most unprecedented fashion. Written by award winning Animation director and Harlow collector Darrell Rooney, and Hollywood historian Mark A. Vieira (Sin in Soft Focus, Dreams Made Real: Irving Thalberg and the Rise of MGM), this is the first major work on Harlow since David Stenn’s myth-busting 1993 Jean Harlow biography, Bombshell: The Life and Death of Jean Harlow. 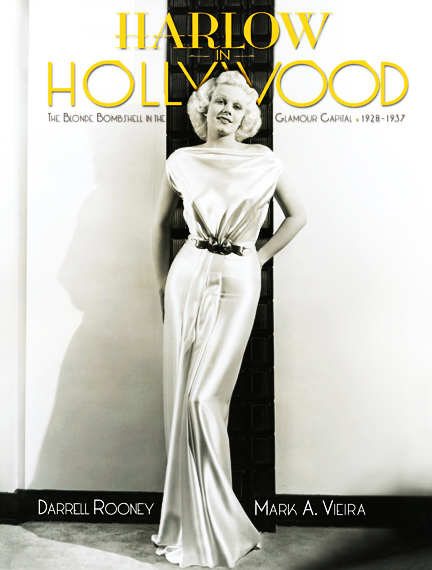 This lavishly illustrated work boasts rare, previously unpublished photos of the legend, and is being released just in time to commemorate the screen legend’s 100th birthday, as well as a very special, first-time ever Exhibition of Harlow Memorabilia at ‘The Hollywood Museum at the Historic Max Factor Building’ in Hollywood. The exhibition is curated by Rooney and Vieira, and will run from March till September. I recently had the chance to meet up with the authors to talk Harlow, classic Hollywood, and why they feel the time is right for a new generation of fans to embrace her. The concept of a ‘centenary book’ itself was birthed about six years ago beneath the warm amber lights of an al fresco restaurant tucked off the hipster hustle of Sunset Boulevard in Silver Lake. It was only fitting that Darrell Rooney and Mark Vieira reconvene here– for dinner at eight, no less– to discuss the upcoming release of their tireless labor of love. CJ: How did the two of you come together on this project? ROONEY: [Mark and I] had been slowly building a working relationship based on knowledge and mutual respect. This is ten years ago easily. Mark was already producing books, which were all extraordinary. One day Mark asked if he could come and see my Harlow collection. And I said, ‘How many days have you got?’ So I took him on a tour of my collection of memorabilia and Mark looked at me with these wide eyes and said ‘We should do a book together.’ And I said… ‘Really?’ Do a book together with Mark Vieira, what an extraordinary vote of confidence. CJ: So you had already felt each other out and knew you could work together. ROONEY: Yes. And in our process, well, I have this huge archive on Harlow; I have collected almost everything written about her, plus I had acquired a huge amount of personal, private correspondence about or by her from a private source. So I know this one thing very well. 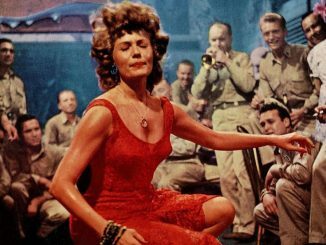 But Mark has a depth of knowledge about the history of Old Hollywood that I don’t have, and he put what I have into perspective–gave it dates, places and resonance. He was able to verify where Harlow was almost on a daily basis and that helped dispel a lot of fictional stories from the press. So this book really tries to be as accurate and definitive as it can be; it gives you: cutting edge information backed up with accuracy and heavy research. CJ: How long have you been collecting Jean Harlow memorabilia? CJ: Did you start off thinking ‘I’m going to be a collector’ or was it more like… osmosis? Harlow and soon-to-be husband Paul Bern “sign in” at the GRAND HOTEL premiere, 1932. Photo courtesy Lisa Burks. CJ: I’m sorry… you own that? ROONEY: [Explaining the background.] Yes. When they had the premiere of the MGM film Grand Hotel at Grauman’s Chinese Theatre (in April 1932) there was a ‘prop’ hotel ledger put in the front courtyard for arriving celebrities to sign. It was a clever publicity gimmick. ROONEY: Paul Bern [her soon-to-be second husband] was with her that night, yes. And this is probably the only document, outside of their marriage certificate that has both their names on it. That ledger was also exhibited at a Thalberg exhibition at the Academy of Motion Picture Arts and Sciences in 2009. Mark was guest curator. CJ: In order to tell a story with images you have to make tough decisions. For someone with a collection like yours, it must have been murder. ROONEY: It was absolutely that. Once we got the book deal we spent six weeks going through the distillation of photographs to tell Harlow’s story visually. I’d come out with 60 photographs for one chapter and Mark, who’s done this a million times, would say ‘Okay. Now we’re going to choose only 12 from those 60.’ So you pull the superfluous ones first. Then you pull the ones you like and absolutely want to keep. Then you start to really edit. Like Mark says, you have to have a reason for every photograph you keep, and you can’t repeat. If you repeat something you bore the audience. We would cull it down to about 20 or so and I’d begin to see the narrative thread. It was quite a learning process. Painful but necessary. VIEIRA: The art of telling a story is so much in the editing, distilling down process. ROONEY: For me, it was like Christmas every day– but you had to give half the presents back. That’s how it felt: exciting but crushing at the same time. CJ: How many photos in the book are previously unpublished? ROONEY: I would say 80 to 90 percent. ROONEY: I think the glamour portraits might have printed other places before– like in fan magazines during the 30s, but that George Hurrell image on the cover has never been published in a book before. CJ: Mark, not only are you a leading Hollywood historian, you’re a true Hurrelian photographer, working in Hurrell’s old studio and using his actual equipment. How long have you been doing portraits a la Hurrell? VIEIRA: Since the early ’70s. Back when I was a student at film school I owned quite a lot of magazines and was struck by Hurrell’s work. ‘Look at his lighting! Look at this!’ And I met him [and got] his phone number. You gotta remember, Hurrell wasn’t a huge name then. Even though he was in his 60s, he was still working on sets doing still photography, still on the company payroll. CJ: But your first interest was in filmmaking? VIEIRA: Yes. That’s why I came down to USC. In 1973 I drove down Interstate 5, took an apartment on West Adams, and started my Graduate work at USC School of Cinema. CJ: And you’ve been here ever since? VIEIRA: Well, I moved back to the Bay area eight years later. And then came back down here twelve years ago: felt like there was unfinished business. ROONEY: He knew he had to come back and write a book on Jean Harlow! CJ: Speaking of: one of the key things that sets this book apart from Stenn’s is the fact you call don’t call Jean’s mother “Mama Jean,” you call her by her rightful married name: Jean Bello. ROONEY: Mark is the one responsible for that. He made this proclamation: don’t get into the ‘Mother Jean’ vs ‘Mama Jean’ issue, use her rightful name. CJ: Stenn’s biography obviously uses the ‘Mother Jean’ phrase to drive home a point, but by calling Jean’s mother by her rightful married name, Jean Bello, it gives Harlean back at least some of her identity. VIEIRA: It’s as simple as this: When you’re around a campfire, telling a story, you don’t want someone to keep interrupting with ‘Jean — Jean who?’ Which one are you talking about? The reader always has to know who you’re talking about. ROONEY: And this really was a tricky thing because, of course, the mother starts out as Jean Harlow. [Once she gets married to Mont Clair Carpenter] she’s Jean Carpenter, and then it’s fine. You don’t have to deal with the whole ‘Mother Jean’ thing at all. CJ: By many accounts she was a rather difficult woman to like. ROONEY: It has much to do with how she was raised. She was raised in a very cold home. Her mother had no power. Her willful father ran her life. She was pushed into a loveless marriage and to rebel, had boyfriends on the side. After her divorce she was on the look out for a rich man to marry. She basically became the gold digger that Harlow subconsciously modeled her screen personae after. CJ: The notes they sent back and forth to each other on Mothers Day… almost frightening in a way. ROONEY: Isn’t it true? I’ve had this conversation with David Stenn many times: the whole thing in that family was ‘I gave you life. You owe me.’ And so Jean Harlow was grateful to the ends of the earth for having been given life by that woman. She was enslaved by this overt gratitude. And she had a terrible time trying to break free of it. Harlean Carpenter with her mother: Jean Harlow. 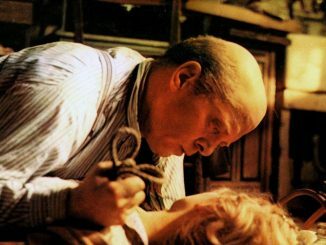 CJ: The Harlean Carpenter/Jean Harlow story guts me every time. ROONEY: It’s the story of two women who conspire to create a single persona. It’s not the creation of one person, but of two people, both of which could not exist without the other. It’s a fascinating symbiotic relationship. There were a lot of healthy things in it…but a lot of incredibly unhealthy things too. CJ: And it handicapped her emotionally. You bring this out in the book: she was not emotionally mature enough to carry on a relationship. VIEIRA: Right. Even though she looked it and acted it. ROONEY: Which is why she’d marry someone like Paul Bern. CJ: Or date someone like William Powell. ROONEY: Right, someone who was never going to be available to her emotionally. 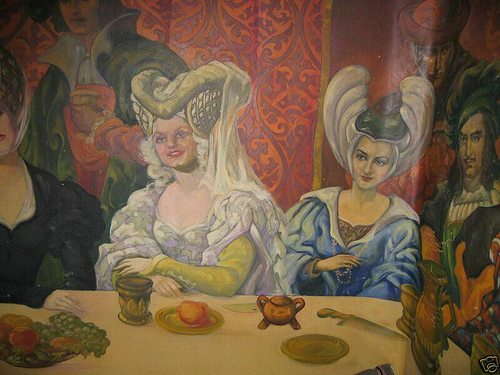 CJ: You mentioned Paul Bern, which reminds me of the mural he commissioned– that Renaissance banquet table seated with his closest friends in period dress. It’s a really important find that is featured prominently in the book. ROONEY: Well I wish I could say that I discovered it, but the credit goes to Lisa Burks. I am so pleased that it’s in our book, and in full color. CJ: It’s such an … unusual piece. ROONEY: I would love to know what the real back-story is. Was it meant to be a surprise for Jean, a wedding gift? It’s certainly not her taste. But its significance is undeniable: it represents Harlow’s ascension into the ‘inner circle’ at MGM. In that way, I think it’s fascinating. I contacted the owner right away when I first learned about it in the late 90’s. One of my scrapbooks had a newspaper article about the woman who bought the Easton Drive house and what she did with the mural. She didn’t want it, so the house painter she’d hired to repaint the house took the mural home in 1933. 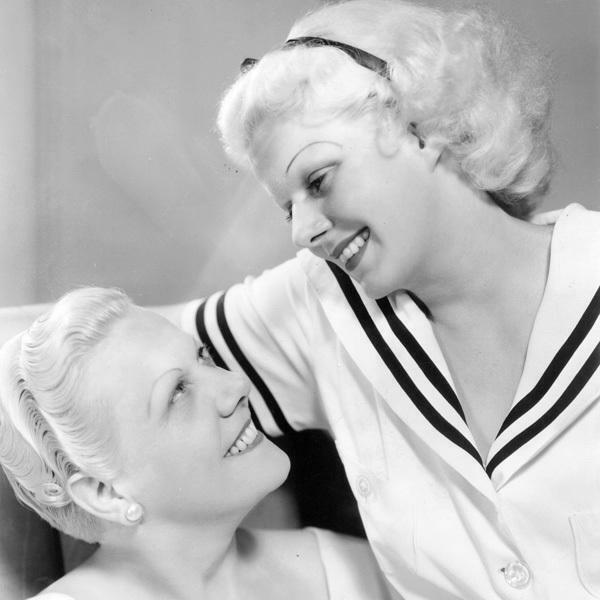 ROONEY: Jean Harlow’s family didn’t want it. CJ: The Paul Bern subject is a weighty one. His gruesome suicide only two months into his marriage with Harlow led to decades of misinformation and sensationalized speculation. 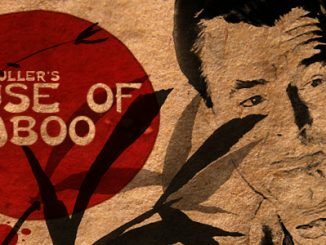 ROONEY: The thing about Paul Bern ’s story is that, to me: it’s not that complicated. The bottom line is that you don’t look at stories, you look at the data; the immutable facts. The ultimate thing I feel about him is that he was somewhat duplicitous: the’ presentation’ of how something ‘appeared’ was often very different than the truth with him. He lived his life that way. And Harlow didn’t see that. The mural will also be part of the Harlow Exhibition: marking the first time it will ever be seen publicly. Another amazing part of the exhibit will be Jean Harlow’s 1932 Packard. CJ: How did you meet the owners of the car? ROONEY: A mutual friend of mine who is a car collector, said ‘Do you want to meet the people that own the Harlow Packard?’ They turned out to be the nicest people in the world, and the third owners of the car EVER. They got it from the second owners who got it from Jean Bello after she took the car– after she absconded it– from [film producer] Hunt Stromberg. She allegedly gave it to Hunt Stromberg to teach his son to drive, then later took it back. What a hustler, huh. CJ: So the Packard is the centerpiece of the exhibit? ROONEY: Yes, and ‘The Hollywood Museum in the Historic Max Factor Building’ is a fitting place to have this exhibit because Harlow originally ‘opened’ the Blonde Room of the Max Factor building in 1935, so there’s a real sort of circular completion here. Fabulous Harlow in her fabulous Packard. CJ: Do tell more about ‘Blonde Room’! VIEIRA: When the Max Factor Salon opened in November 1935 there were three separate rooms: the Blonde Room, the Brunette Room and the Red-head Room. A movie star of each persuasion officially ‘opened’ each room and was photographed cutting the ribbon alongside Mr. Factor. Claudette Colbert opened the ‘Brunette Room’ and Jean Harlow opened the ‘Blonde Room’ and for the first time showed her real honey blonde hair in public. And something else that doesn’t show up in the text of the new book is the riot that occurred there. VIEIRA: Yeah, there was a riot at the Opening that night. And a famous western star—I haven’t been able to find out which one—but the L.A. Times ran a blind item about awestern star who got so drunk at the Max Factor Studio party that he had to be ejected. I guess it could’ve have been Tom Mix. ROONEY: If it had been Tom Mix, Jean would have taken him home! She loved Tom Mix from her childhood. CJ: So tell us: why this book? Why now? ROONEY: It’s a case of awareness. We want to see Harlow embraced by a new generation. We were looking for ‘the angle’ years ago, and I have to hand this to Mark: he’d say, ‘What landmark is coming, you know, some kind of a milestone event?’ Eventually, we realized 2011 was going to be Harlow’s hundredth birthday. Her centenary. That was very significant and we felt this was the milestone that needed to be commemorated; there had to be a book. And with Mark’s experience he knew it couldn’t just be a book, there had to be a series of events tied into it, like a public Exhibition that the press could cover and people could go to. One thing we wanted to do to make the book unique and different from other bios was to tell Harlow’s story in her own words as much as possible. We used never-before-seen private correspondence and interviews to achieve this. However, it got very tricky concerning the Paul Bern period of her life. There is so much written about it, and so much of it is conjecture. How do you sort it out? Mark kept saying: Whenever you’re confused, ask yourself ‘what is Harlow’s story from her own point of view? Don’t tell events from someone else’s point of view – what was her experience?’ And at times that meant a lot of rewriting. And that’s what’s makes the difference with our book, Harlow In Hollywood. That is one of the key things that sets this book apart: this is Harlow’s story told in her own words and from her own experiences. 50 Years Without Buster Keaton: My Neurotic Relationship with Buster Keaton and Why He Makes Me OK with Being Me.